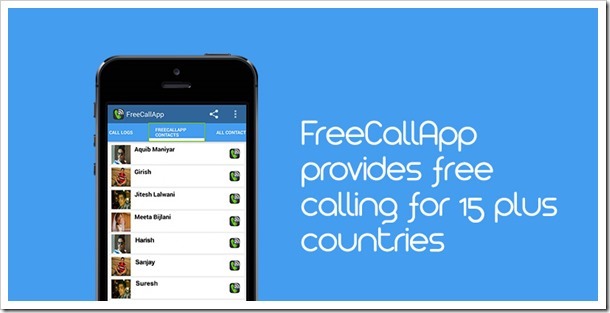 FreeCallApp: An Android App Offering Free Voice Calls Even On 2G Network! Ever searched the App Store for apps that let you send free text messages, or make free calls? Of course you have, don’t deny it. I have too! But, to date, I haven’t come across an app that works as advertised and is tailored to work in the Indian sub-continent. Don’t tell me about Skype, or Viber, or half a dozen other such apps. They exist, and they work well. But do they work well on a 2G connection? Err, no. And that’s where FreeCallApp comes in. FreeCallApp is the lovechild of three talented Indians – Jitesh Lalwani, Aquib Maniyar and Dhiraj Bijlani – who wanted to provide the Indian audience with a way to make calls using slow 2G connections that dominate this country. 3G net packs are getting cheaper, agreed, but most people still use 2G connections. As of 2013, 59% of India were on 2G net packs, with the rest having moved on to 3G. Even then, 3G coverage isn’t the best. More often than not, the signal strength isn’t satisfactory to get constant and good speeds. In a conversation with Jitesh Lalwani, we learnt that FreeCallApp uses advanced compression algorithms that make a voice connection between two users (say user A and user B) extremely lightweight, as much bandwidth as a simple “Hi” message sent using WhatsApp. User B’s phone will start ringing within 1-2 seconds, regardless of whether he is on a 2G or 3G/4G connection. As long as he is in one of the supported countries, it will work just fine. Pretty impressive, no? We did try to dig around and learn more about their (secret?) compression algorithm, but we didn’t get much scoop. At present, you only need to give up your phone number for FreeCallApp to work. A User Name with an optional profile picture and status can also be set-up. The phone number is collected for security purposes only. Jitesh promises that there aren’t any privacy concerns to keep you up at night. You do benefit from simply giving your phone number; all the contacts in your phone who are using FreeCallApp automatically get listed as friends within the app. Then, you can place unlimited free calls to them using your internet connection. At present, FreeCallApp doesn’t have any monetizing plans in action. But we are plenty sure that Dhiraj Bijlani, the business head of FreeCallApp, is working on something. Hopefully it will be non-intrusive and not make the app a pain to use. Download FreeCallApp on your Android device from Google Play Store. It’s a free app, give it a shot and let us know how you like it! 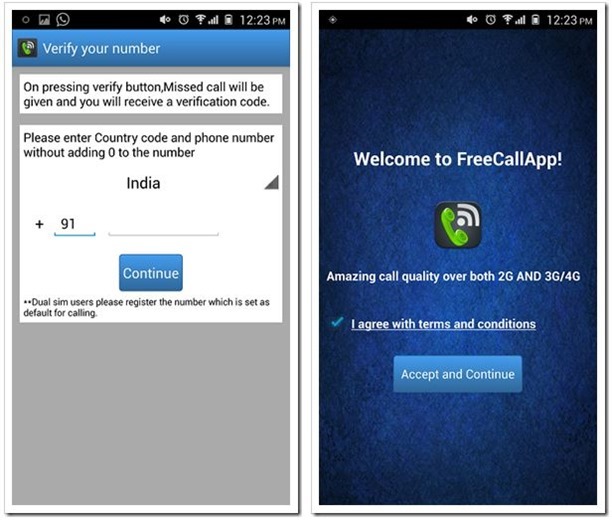 "FreeCallApp: An Android App Offering Free Voice Calls Even On 2G Network! ", 5 out of 5 based on 1 ratings.